What is Sweetcron? Check out my quick review of the lifestreaming software: Set it and forget it, Sweetcron personal lifestream application. Originally a http://this.isdereks.com experiment, I decided there wasn’t any reason why I shouldn’t share the theme with the Sweetcron community – theme choices are limited. 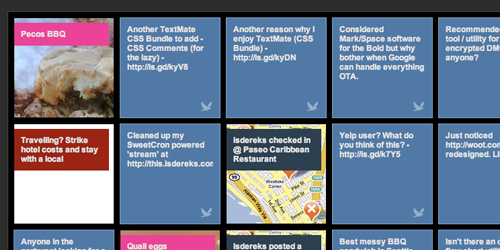 The SocialCubes theme is extremely simple. I stripped out permalinks and pages but feel free to add support yourself. The included themes distributed with Sweetcron – namely Boxy – should give you a good idea on where to start. Your aggregated items will be displayed on the front page as cubes which link directly to their respective sources. No hopscotching from 1) your Sweetcron front page, 2) your Sweetcron single post page, and finally 3) your original source. The source code is hosted on Google Code. Once you have properly installed and configured Sweetcron on your own server, download the source and upload the ‘socialcubes’ directory to your themes directory found in: system/application/views/themes. Out of the box, SocialCubes supports Twitter, Brightkite, Delicious, and Flickr. Use the existing source snippets as samples to modify for your own favorite sources.